If you're wild about wearing loafers, then you definitely need to invest in our triple packed SockShop Wild Feet Plain Loafer Trainer Liners. 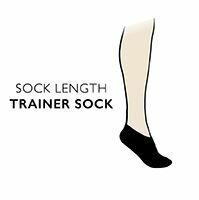 These ladies fit, extra low cut cotton rich socks come to you in a mix of three single colour pairs, ready for slipping your feet into before you slip into your loafers, pumps, plimsolls or trainers. SockShop Wild Feet Plain Loafer Trainer Liners have zigzag pattern grips set into the inner heels to stop them from slipping underfoot, and support bands at the mid-foot. The cuff edge is single layer for added comfort.